I think I am at the breaking point with the house I live in. I beginning to feel that enough is enough. This house has been a wonderful place to live and I feel that I almost own it because I do care for what happens to it. Indeed my landlords have asked if I were interested in purchasing it. I had to decline since I am not ready to purchase and I know at one time when the house was for sale they were asking quite a lot. The breaking point is my utility bill. My bill is an averaged plan, which means it is always the same amount every month. The utility company bases the average on the previous years use and then every year, usually in September they re-evaluate your usage and then raise or lower your next yearly average. I went on this plan awhile back because my utility bills would run amok. One month it was over $300 and then over $400, then $500 and then $750. This year my averaged bill was $270 a month. However, we just got slammed with a $794.24 utility bill! This is the downside to an averaged bill. If you use more electricity during your set sum, it builds up an owed balance and if the owned balance doesn’t get covered by what you are paying by the end of the yearly cycle you receive a bill for the remainder to be paid in full. As a result of the extra electricity used this year I received a new monthly average of $337 a month! This is a two bedroom, 1,949 square foot house… not a mansion! I’m fairly certain I know what caused the extra electricity usage. It was from heating the greenhouse last winter, which means this year I won’t be heating it with an electric heater. I think I will have to try propane. My time in this house may be coming to an end soon because Melissa will be getting her own place sometime next year and I’ll have to cover the utility bill myself. The utilities are simply too high. Sigh. In other news I have completed the reconstruction of Melissa’s tester. There is some touch up work to do with a stain pen on areas that lost veneer and a few areas will need wood fill. It will never be perfect again, but I think it turned out rather nice. 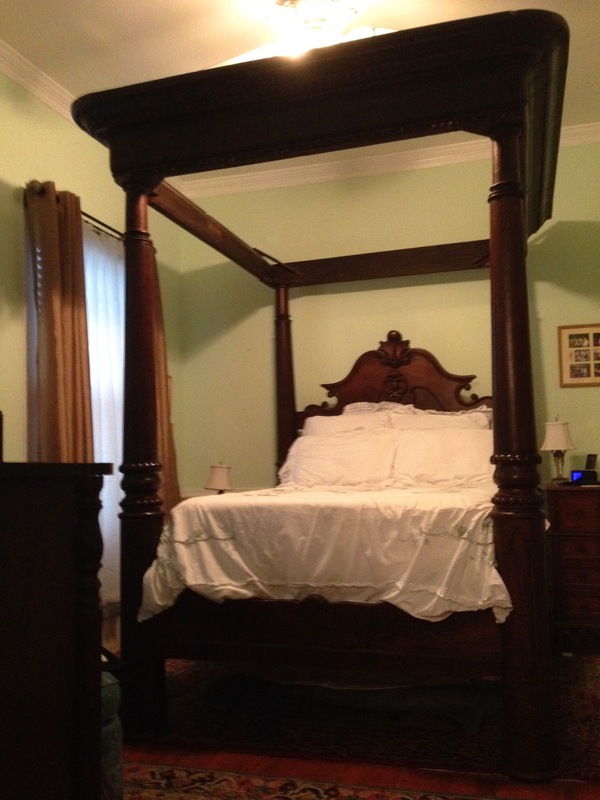 Melissa is currently in Savannah visiting with friends and looking for fabric to create the canopy, which will be the final detail to complete its restoration. That looks so good! You have done great work! Don’t blame you for moving. I bet that $794 bill was a real shock. The bed looks AWESOME! Yes, it was a shock. I thought those days were over. I had a $750 bill about three years ago, but that was before I went on the averaged plan. However, I have learned the averaged plan can have drawbacks too. We are still working on the canopy, but once it is done I’ll post a picture.